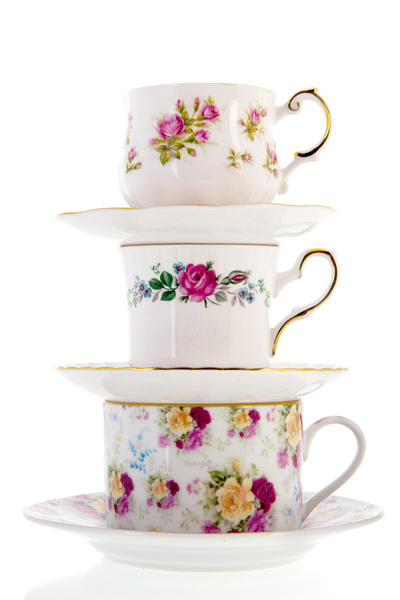 Vintage tea sets are often passed down as heirlooms from one generation to the next. If you have inherited tea cups that you do not plan to use for their original purpose, you may wonder how you can upcycle them to give them a new purpose and meaning in your home. These six unique tea cup upcycling ideas will allow you to transform your crockery and express your creativity. Tea cups are the perfect depth for candles. To make your own beautiful and artistic tea cup candle, pour wax inside of the cup, place a wick in the center, and allow the wax to harden. Once the wax is set, trim the wick to the right length. You can also use tea cups as candle holders if you prefer not to pour wax in them. Votives are the right size to fit inside the cups. You can keep the votives in place by pouring a small bit of wax inside the cup or using a sticky felt pad to hold the votive candle secure. Tea cups are also the right depth for planting flower seeds. You can get your flowers started for spring by planting the seeds inside dirt that you place in each tea cup. Tea cups can also be used to grow decorative mosses or cacti. These plants do not require a deep amount of soil to grow. Given their light weight and thin dimensions, tea cups are ideal to use as bird feeders. To create a tea cup bird feeder, first coat the inside of the cup with a liquid or soft food that is safe for birds to consume. You could use honey or smooth peanut butter for this purpose. Next, pour bird seed over the sticky surface inside the cup. Hang the cup with twine by the cup's handle. Refill the cup as needed to keep your backyard feathered friends happy and well-fed. The bright glare from a reading lamp can be uncomfortable. You can soften the glare and upcycle your tea cup by removing their bottom and then placing the cup over the bulb in the lamp. It should be noted that this type of repurposing is best carried out on cups that can withstand high temperatures. Cups made out of porcelain or fine china could break or shatter from the heat from the bulb. You can create an artistic, if not impromptu cake stand by attaching an upturned tea cup to the bottom of a plate. The upturned cup will be strong enough to support the weight of the plate and the cake you place on it. You should use a cup that has a relatively thick base, however, and make sure that the plate is centered on the cup so that the cake's weight is distributed evenly. You can secure the cup to the plate's bottom with super glue. Cake in a cup is a big hit at family dinner parties or even your kids' slumber parties. Rather than use your coffee mugs, you can make cake in a cup in your heirloom tea cups. To make cake in a tea cup, first make sure each cup is clean and coated with spray oil. Then mix all of the ingredients in each cup as directed by the recipe. You can then bake the cakes and have adorable individual tea cakes for the party. As much as you appreciate inheriting an heirloom tea set, you may never intend to use the cups for drinking or serving tea. Rather than allow these beautiful treasures to stay hidden away in a cupboard, you can bring new life to them by repurposing them. These upcycling ideas are both artistic and also practical.